Bond runs in to Melina Havelock on a mission in Corfu. Here 007 is surveying the payoff of a free-lance hit man, Hector Gonzales. Before the transaction can be completed 007 is taken prisoner and is only able to escape after Melina perforates Gonzales with her crossbow. The pair make a not-so-hasty escape in her clunky little Citroen 2CV. "I don't expect you to understand, you're English, but I'm half Greek. And Greek women like Elektra always avenge their loved ones!" Whilst Bond and Melina are quickly allied in the fight against her father's killer (he was searching for the missing ATAC defence system), this lovely damsel in distress does not cave into Bond's advances until her revenge is sought. With the world put to rights, 007 and Miss Havelock spend a passionate night aboard the Havelock family launch, far away from Bond's bosses in London. Passionate and strong-willed, Melina Havelock has a spark of Greek in her blood and a lust for revenge after the death of her family. When she runs into 007 it becomes more than a simple matter of assassination for Melina, who needs the villainous Kristatos alive for questioning. Miss Havelock is bold and handy in a fight, when she finally agrees to play the game Bond's way. Melina proves and willing ally on the "For Your Eyes Only" mission and helps Bond to track down the ATAC. Born in 1957 as an only child, Bouquet grew up in Neuilly-sur-Seine under the guidance of her father and strict stepmother. In her late teens Carole began to frequent the movies and found a passion for acting. After high-school, Bouquet enrolled in the Superior Conservatory of Dramatic Arts whose campus was in central Paris. She had initially considered studying philosophy but here underlying calling to the dramatic arts won over. In 1977 and still in drama school, Carole won her first onscreen role in Luis Buñuel Portoles' picture "Cet obscur objet du désir" ("The obscure object of desire"). The famed French filmmaker took a shine to Bouquet and with his support began her career on screen from an early age. Her beauty won her many roles, but as she explained in later interviews, she was so shy that until her mid-twenties Bouquet relied on others to help her find work. In the late 1970s she caught the attention of director Lewis Gilbert who considered casting her in his upcoming "Moonraker" - however this was not to be. 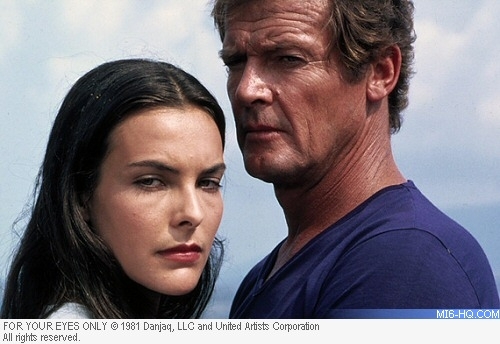 It was in the following Bond picture, "For Your Eyes Only" directed by John Glen in 1981, that this lovely French star was introduced to Hollywood. She rose to fame both in France and the English speaking nations thanks to her role as Melina Havelock. 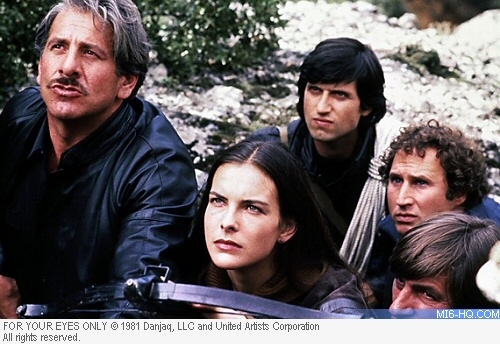 After her Bond adventure, Carole returned to her homeland and appeared in a run of mildly successful films before landing a role opposite Gérard Depardieu. The film was the internationally acclaimed "Trop belle pour toi" ("Too Beautiful for You", 1985) and she took the part of Florence, the wife of well-to-do car dealer as played by Depardieu. For this role, Bouquet won the Best Actress award at the 1990 César awards. 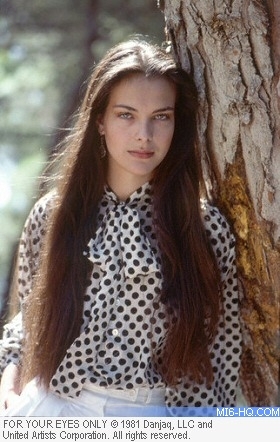 Early in her career, Carole Bouquet was married to the director Jean-Pierre Rassam with whom she had a son, Dimitri. Rassam passed away in 1985 but Bouquet continued a prominent career in the French film industry. She appeared in a biopic of the Swiss leader Jörg Jenatsch and 1989's "New York Stories" as directed by Woody Allen. In 1997, Bouquet was romantically linked to her frequent co-star, Depardieu. The relationship lasted until 2004, and the pair were briefly engaged to be married prior to the breakup. Today she still maintains a selective yet active career on the screen. She is lined up to lead the cast of "Protéger et servir", scheduled for release in late 2009.